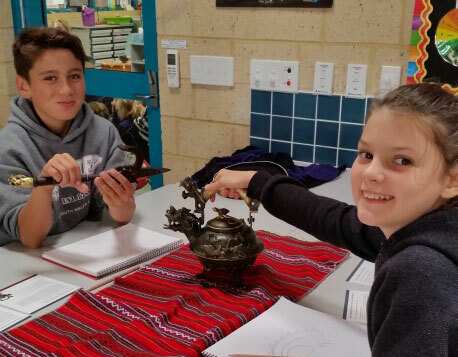 The Year 2 – 6 students have been exploring sculptures from around the world this week! Lakelands has been lucky enough to have The Elaine and Jim Wolfensohn Gift Suitcase to visit, which is a travelling Art exhibition belonging to the National Gallery of Australia. A key feature of the Wolfensohn Gift Suitcases is that the art works can be handled. The shapes, surfaces and tactile qualities of each work can be explored, examined and enjoyed.